What was behind it? What went wrong? Why did it happen? 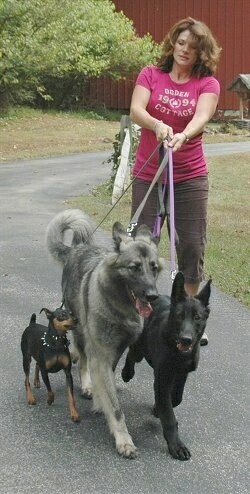 A lady was walking all three of her dogs: a full-grown Miniature Pinscher, a full-grown Shiloh Shepherd, and a 15-week-old black Shiloh Shepherd puppy. 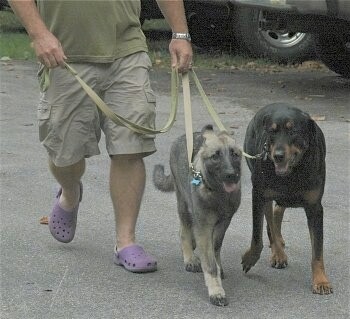 All three dogs were pulling in front of her, while she was behind them holding the leads. They ran into a male neighbor who was also walking his two dogs. 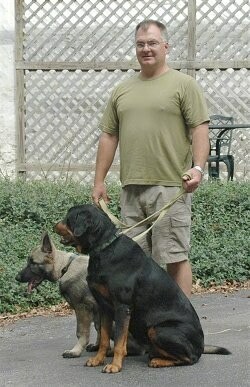 He had a full-grown Rottweiler and he also had a 15-week-old Shiloh Shepherd puppy (the Shepherd pups were littermates). The owners stopped to say "hi" to one another. Suddenly the lady's Min Pin started an all-out rumble with the neighbor’s Rottie and Shepherd puppy. This was broken up by the two owners. They pulled their dogs off of one another. The Min Pin had been known to attack other dogs in the past. Seconds later, while the lady's adult Shepherd was sniffing the Rottie's back end, the Rottie turned to try and sniff the Shepherd, and the Shepherd attacked. An all-out attack. The Rottie then attacked back at the adult Shepherd. 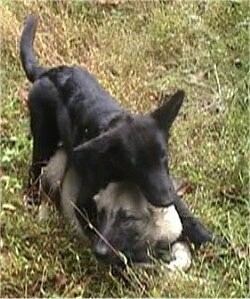 The adult Shepherd dominated the neighbor’s puppy as well, by getting on top of him. This was the first time the adult Shepherd had attacked another dog. The lady owner with the three dogs yelled loudly at her dogs as she pulled her Shepherd off of the Rottie and pup, but in the process mistakenly dropped the lead to her own Shepherd puppy. While the neighbor with the two dogs started to walk his dogs away, her 15-week-old black pup took off, running after the Rottie and Shepherd pup. The lady's black pup proceeded to dominate the man's pup by pinning her to the ground and growling terribly. Now we have two 15-week-old puppies (littermates), one dominating the other. According to the lady owner with the three dogs, the neighbor’s Rottie is very well-trained and an obedient dog with good social manners. She did not believe the Rottie was at fault since her Min Pin attacked first. But, why? Why would all three of the lady's dogs attack? Why would one puppy attack another puppy? Why would a dog that usually gets along with other dogs suddenly attack? 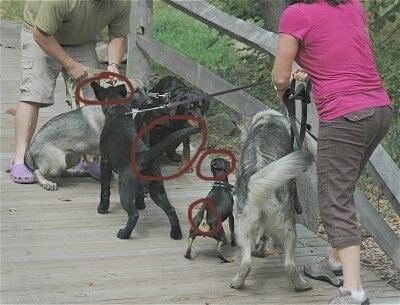 What's behind this in the dogs’ minds and eyes. How do the dogs see this story? 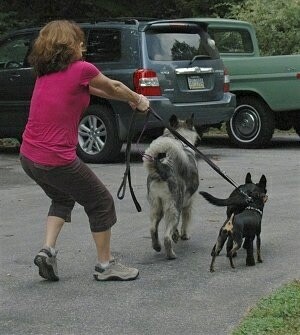 The lady owner was walking all three of her dogs at one time. The pack was out for a walk. In a dog's world, there must be a leader and the leader always leads the way. In this case, rather than the human owner, it was the Min Pin first, followed by the other two dogs, the adult Shepherd and the Shepherd puppy, then the human owner. In her dogs’ eyes, she was a follower in her pack; the dogs were leading. When the first dog attacked, the owner freaked out, so the dogs saw her as weak and instinctually thought they MUST take over. It’s instinct. Dogs pick up on human energy and see fear and anxiety as weak energy. Dogs do not listen to weak energy and they do not listen to followers. The lady with the three dogs was being perceived as a follower in her own dogs’ eyes, so the pack took orders from the Min Pin. The Min Pin decided it was time to attack and his energy put the rest of the canine pack in attack mode. The only one in the pack that didn't attack was the human, but in the dogs’ eyes, that was OK, because the human was the weak pack member. The others were mentally strong enough to make up for it. The Min Pin is the leader. She attacked first and set the energy for all three of the other dogs. The 15-week-old black puppy is second in line. The adult Shepherd is third in line. And the lady owner is last in the order. 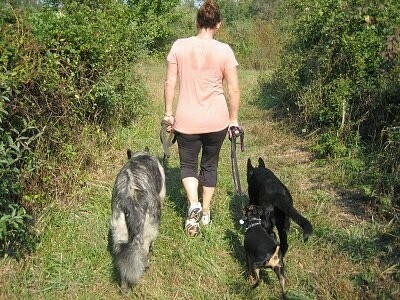 She was walking behind the pack, giving the dogs a sense of leadership over her. She initially greeted the neighbor with much excitement, which the dogs perceived as unstable energy. Her dogs also felt her emotions when the first dog attacked; it startled her. To the dogs she released weak, unstable energy during the meeting of these two packs. She was automatically put last in the order. The weaker minded dogs are last. The proper way to walk a dog is with the dog walking either beside you, or behind you, never in front; leads should be loose with slack, no pulling. This may seem petty in a human's mind, however it means a lot in a dog’s mind. Instinct tells a dog that the leader goes first. An owner needs to show the dog they are pack leader 100% of the time. Not 95%, but 100%. The leader goes first, therefore, if you walk your dog(s) with them in front of you, as opposed to beside or behind you, they are pack leaders during your walk (in their minds). Let’s say, when you get home you then display leadership, it gets confusing to the dog. The line needs to be really clear to them. In the pack, the top wolf is not wishy-washy. He’s boss 100% of the time and no one gets away with anything. Within a pack of dogs, if the top dog IS wishy-washy, another dog takes over the leadership role. It’s their instinct to take over the role if the leader is not 100% stable. Therefore, if a dog sees a human owner going back and forth, it wants to take over. Dogs do not reason this out first in their heads as a human would before he takes over; it's instinct, they don't think, they just do. Above is a picture of the two packs meeting. First, let’s look at that Min Pin (little dog), the one that started the fight two weeks earlier. Her ears are pinned back to her head, her tail is rigid, standing straight up; her whole body says "fight." Now look at the black Shiloh Shepherd puppy. Her tail is up and rigid, and her ears are back. She is fixated on the other dogs in a fight mode as well. The lady's adult Shepherd is not showing signs of fight. While she is pulling, her tail is relaxed, her ears are not pinned. Now take a look at the man's dogs. 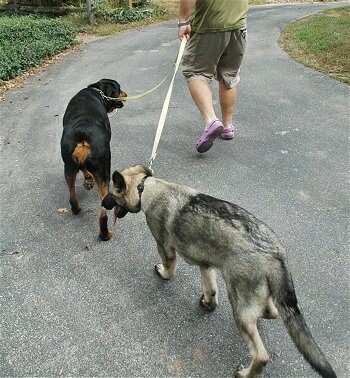 The Rottie is not pulling on the lead, he is sitting slinked down. The man's gray Shepherd puppy is showing submissive signs as well. Her tail is lowered, her ears are back, but not pinned, she is sitting and not pulling on the lead. The Min Pin tends to be aggressive with other dogs on a regular basis. The adult Shepherd is usually laid back, and besides this one dog fight, never got into a fight with another dog before. The black Shepherd puppy, on the other hand, had been showing signs of trying to dominate other dogs. 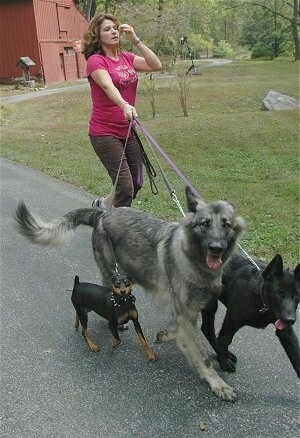 The owner had always thought her adult gray Shepherd was the boss simply because she was older and a bigger dog. To test this, the owner got some tasty meat and called all three dogs over. She dropped the meat in a neutral spot on the floor. Who got it? Who tried the hardest? Who backed away? Sure enough, out of four pieces dropped, the Min Pin got three, the black puppy got one. The adult Shepherd didn't even try that hard. She let the others have it. The Min Pin and the black Shepherd pup, on the other hand, were fixated and adamant that they get the meat first. The lady owner realizes her dogs are in charge, realizes she has two dominant dogs on her hands and is taking steps to correct this behavior, starting with the "Proper Walk". One example (and a true story) of a dog feeling a person's emotions/energy... A couple was driving down the highway in a full-size van. The van had no windows in the back, it was dark outside and the dogs were in the back sleeping. In the side view mirror the driver spotted a cop suddenly putting on his lights. It startled the driver and a chill of fear when through his body. The human passenger who was sitting right next to the driver didn't have a clue to the driver’s emotions, because the driver didn't make a sound—no facial expressions, no body language—and didn't see the police lights. However, at the exact moment the driver felt the chill of fear, one of the dogs in the back of the van awoke, stood up and started growling. The dog felt the owner’s energy. Families who fight or argue a lot among themselves are more likely to have problems with their dogs. The dogs do not understand, for example, the yelling is because the kid didn't do their homework, or get to bed at a certain time. What they see, or rather what they feel, is weakness in their pack. When your dog sees you upset, yelling, hyper, etc., in your everyday life, it feels your energy and perceives it as weakness. So you could be doing everything else right, but it is picking up on your emotions. Dogs do not speak words, they communicate with body language and energy. Dogs can feel your emotions. It is important to remain strong and confident with your dog at all times. Be his solid, stable pack leader 100% of the time and be sure to provide the proper amount of exercise and you will have a happy, balanced dog and a true friend. 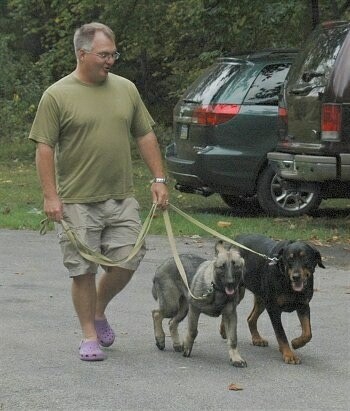 The owner with the three dogs has been working daily with her dogs to regain leadership, starting with the proper walk. Since the Min Pin was the dominant dog of her pack, the owner kept the Min Pin in the very back the majority of the time. To our slight surprise, the Min Pin was not even trying to get in front, like she had in the past. One would think the Min Pin would get upset, being pushed out of the number-one spot, however she actually seemed happier, most likely because she does not have to take on responsibility for the entire pack. The weight has been lifted from her tiny shoulders. Above is the same owner who previously had trouble walking her three dogs. She is now walking five dogs—two Boxers, two Shepherds and a Min Pin. The little Min Pin (far left) and the Boxer (far right) are both dominant dogs that, in the past, have gotten into dog fights. Both were considered unpredictable around strange dogs. Knowing we both owned unpredictable dogs, you know we just had to get the two together for some good old "anti-fight" therapy. The plan was to introduce the Min Pin to two Boxers that she had never met before. The first meeting of our dogs would set the tone for the day, and we knew we had to do it correctly. We decided the Min Pin, which had just gotten into a fight 2 weeks earlier, was the most unpredictable of the three dogs. Before bringing the Boxers out, we made the Min Pin sit with her back towards the Boxers, allowing the Boxers to smell the Min Pin. We did not allow the Min Pin to turn and look at the other dogs. The Min Pin did turn and growl once, and this was immediately corrected with a tug on the leash. 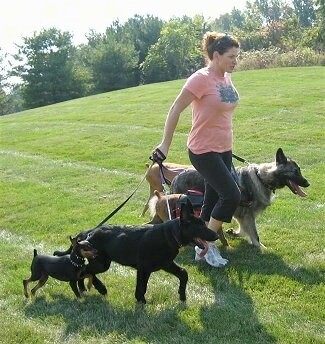 After the smelling was done, the dogs seemed like they were going to be OK, so we unsnapped the Min Pin from her lead. I decided not to unsnap one of the more dominant Boxers until after our walk. I have been working on her unpredictability with other dogs and have clearly noticed she does much better with other dogs after a long walk. After the walk, none of the dogs had the slightest interest in dominating one another. The day was a complete success! Within every litter there are dogs who are born followers and dogs who are born leaders. In other words, dogs with different dominancy levels. Even the most dominant of dogs can get along with other dogs so long as the owners display strong leadership and proper dog to canine communication. If dogs are raised together and well socialized, they can be good friends. The bottom line is it's all about the human owners. Owners need to be stronger minded than the dog, displaying enough authority to convince the dog that the human is in charge and is setting the rules that must be followed. Dogs that are secure with the amount of leadership the human’s project will not fight with other dogs, so long as the humans are able to properly communicate their wishes to the dog.